In 2016, the Belgian bank Crelan asked their agency, Prophets, to completely redesign both the online banking environment and the marketing website. After setting up expectations and requirements with their client through preparatory workshops, Prophets started a series of user tests with UXprobe. They tested competitors’ websites, Crelan’s current website, and a possible structure of the new website. Discovered that their favorite competitors’ website had a number of flaws in terms of usability. Found out that their current website, despite an outdated feeling, had still many valuable aspects that were worth being kept. All these learnings helped them to take the right decisions at a very early stage. These early decisions prevented them from spending a huge amount of time and money on a design that would have quite certainly proven wrong later on. It allowed them to adjust the user’s journey into a flow that was much easier to follow. 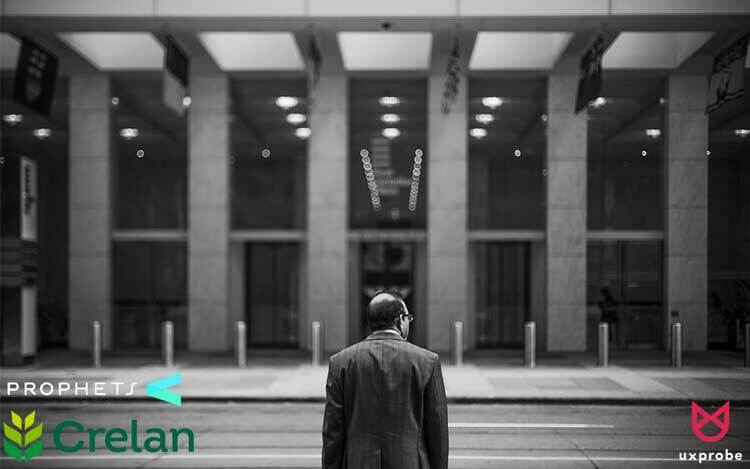 Crelan was introduced as bank brand after the merger of Landbouwkrediet / Crédit Agricole and Centea in 2013. Rooted in agriculture, today it is a full-service bank offering financial services to consumers as well as businesses (agricultural and others). It is part of Crelan Group, which was 50 percent owned by the Crédit Agricole Group. In June 2015 Crelan became again a 100% Belgian cooperative bank, owned by its clients. Prophets is a marketing and advertising agency based in Antwerp, Belgium. They were founded in 2004, and have since helped businesses to make strategic choices in the digital marketing space. Prophets have a broad specialization in marketing and communication strategy, web application development, and various other services. Daan Richard is the Strategy Director at Prophets since 2014. In this project with Crelan, Daan is responsible for the overall strategic planning and has conducted client workshops to understand the client’s expectations. He has to liaise with the Technology and UX Director at Prophets, Kris Van Hauwermeiren of this project as his role is to convey the client’s expectations to the technical team. Daan played an important role to balance the technical and strategy aspect of user experience. Prophets has been working with Crelan for several years now, creating brand and marketing campaigns, and developing all sorts of communication materials. In 2016 Crelan asked the agency to start an important new project: the complete redesign of their marketing website. The existing website had been launched in 2013 but was already seen as very outdated. This motivated the bank to ask Prophets to start from scratch. Following his client’s wishes, Daan organized a series of ideation workshops with the online communication team to explore their expectations, and to align every stakeholder with a common vision. Based on these preparatory workshops, a very simple structure of the website was established. At the same time, an extensive competitors research was conducted as well as an evaluation of the current website. At Prophets, Daan, the strategy director, works very closely with the technology and UX director, Kris Van Hauwermeiren. This collaboration results in an emphasis on real-life proofs and data-based decisions. In this particularly ambitious project, they wanted to be especially cautious. For a designer, it is very exciting to be requested to design a website from scratch and to come up with brand new ideas. As experienced professionals, Prophets knew the potential risks behind this thrill. For both the first structure of the website and the competitor’s research, Prophets carried out users’ interviews, test panels and surveys to test and verify hypothesis and assumptions that were made during the exploratory phase. But that was not enough, they needed quantitative and qualitative metrics to bring undeniable support to their decisions. To create the first benchmark and gather ideas on best practices as well as insights on what to avoid, Prophets offered to research Crelan’s main competitors. They tested the four main Belgian banking websites. One, in particular, was Crelan’s management team’s favorite. The results of the user tests came as a great surprise: the website that Crelan was fond of, thinking it had the best design and user experience, revealed to have many flaws. Made at the very beginning of the project, this discovery prevented Crelan from investing time and money in an inspirational model that was not worth it. In order to challenge the idea that everything had to be started from scratch, Prophets decided to perform user tests on Crelan’s current website. The results showed that users appreciated the no-nonsense approach of the current website. They felt comfortable with the familiarity of it, and how the experience was similar to other banking websites. No need to redesign the entire experience, what the website users wanted and needed had to be practical and functional. As such, the well-received principles of the current website were kept for the new website design. Based on the outcome of the workshops with Crelan’s team and the first results of user testing, Prophets created the structure of the new website. It was a very simple prototype with boxes and labels, recreating the navigation on the website. 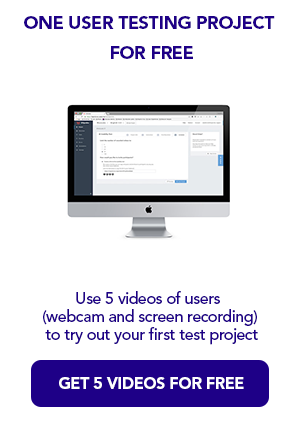 UXprobe’s system allows testing even the simplest prototype. Prophets was able to observe and gather information of the routes users took during the test: understanding why users took certain paths and the points they got stuck or lost at. On one hand, the results of the usability test gave Prophets insights into the optimal structure of the content, the priority of the respective components and methods of bundling information. This allowed them also to decide what sort of inspiring content appealed most to the user. On the other hand, it helped them to solve another issue. From a cross-selling perspective, it is interesting for banks to cluster their information in themes and key moments, instead of just offering products. During the evaluation of the current website, the users clearly expressed that the main navigation still needed to display the products and services. It was difficult to find the best approach to do so, and the user tests on the website’s structure helped solve that puzzling issue by showing without any doubts what was working and what was definitely confusing the visitors. Prophets felt that it was necessary to perform early usability tests with UXprobe as they did not want to introduce any doubts before bringing results to the table since the concept was already worked on and validated with Crelan. Thankfully, the results of the tests showed many confirmations and areas for improvements which made Crelan highly satisfied. The test on Crelan’s current website showed clearly that some parts of the existing structure and content received positive feedback from users. That discovery had them realize that they could keep some principles that were good on the current website. Testing on a label’s structure was a very cost-effective way to experiment with and to improve the user’s journey throughout the website. The decision to conduct user research through tests early in the project has certainly minimized any future opportunity costs.